Sylvain Chauveau has done several albums on Type records, Les Disques du Soleil et de l'Acier, Creative Sources and FatCat: minimal, melodic compositions for piano, strings, winds and discreet electronic sounds, with silence as a musical element in itself. He has played live in Italy, USA, Canada, Salvador, Japan, England, Austria, Germany, Belgium, Switzerland, Sweden, Spain, Portugal, Greece, Czech Republic, Slovenia and France. He opened a few times for Sigur Ros (2002, 2003), played with Christian Fennesz (Musique Action festival 2004) and did remixes for some bands. 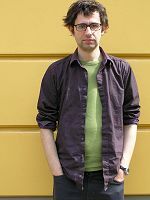 He composes soundtracks for Sébastien Betbeder's movies, especially for the full-length film "Nuage" (screened at the Locarno film festival 2007, released in september 2007). Film director Thomas de Thier asked him to compose the original soundtrack to his movie "Feathers in my head" (2004). He also did scores for choregraphers (Pierre Rigal / Aurélien Bory, Serge Ricci) and for performances with writers (Mark Z. Danielewski, Félicia Atkinson, Joris Lacoste) in France and abroad. Sylvain Chauveau plays with the band Arca (with Joan Cambon), 0 (say "zero", with Stéphane Garin, Joël Merah and Maitane Sebastian) and On (with Steven Hess). He was born in 1971 and lives now in Brussels. Sylvain Chauveau : how to say this name ?